Aztec Riches Casino is an iGaming brand that is managed by Apollo Entertainment Limited. For the most part, Aztec Riches is operated under a Malta Gaming Authority licence, but the site has further partnerships to ensure widespread accessibility across international territories. From an operational standpoint, Aztec Riches has been active for quite some time, having opened in 2002. That makes it one of the oldest brands currently under the ownership of Technology Services Trading Limited. Another key relationship is Aztec Riches being present on Casino Rewards. Aztec Riches makes us all think of the historical times when the Spanish conquistadors and English privateers travelled to South American in search of El Dorado, or the Lost City of Gold. As such, the visual branding is designed to show all kinds of Aztec Riches. This acts as a glamorous introduction to what is a pretty diverse casino site. Aztec Riches favours deposit bonuses with lower percentages, but players do have the options of unlocking large sums if they should wish. As ever, Gambipedia.com must advise all players to read the terms and conditions. These contain important details like the €/$/£20 minimum threshold that is needed to trigger each of the bonus offers in the welcome package. You can also look to the decline of 60x to 30x wagering requirements on the second deposit as justification for claiming each of the bonus offers. Ultimately, it will be much easier to claim 30x rather than 60x when the time comes. Deposit methods: Abaqoos; ecoPayz; eCheck; EntroPay; eKonto; EPS; EUteller; eWire; Ezi-Pay; Fast Bank Transfer; flexEpin; GiroPay; iDebit; Instant Banking; Instadebit; Jeton; Kalibra; MasterCard; Maestro; Moneta; MultiBanco; Neosurf; Nordea; NETELLER; paysafecard; PayPal; Postepay; POLi; Przelewy24; Qiwi; SOFORT; Swedbank; Ticket Premium; Trustly; uPayCard; uNet; VISA Electron; VISA; Skrill; SWIFT/Wire. Withdrawal methods: eCheck; EntroPay; Ezi-Pay; ecoPayz; Fast Bank Transfer; Kalibra; Maestro; MasterCard; NETELLER; Postepay; PayPal; Qiwi; uPayCard; VISA Electron; VISA; Skrill 1-Tap; Skrill; SWIFT/Wire. Desktop users can play instantly on Windows or MAC, as Aztec Riches runs using Flash software, so make sure you are current with the latest updates. Alternatively, it is possible for Windows users to install the Aztec Riches desktop client. This runs with HD graphics and includes the full range of 550+ games. Users should be aware that Aztec Riches does not have a mobile platform. There are plenty of mobile-compatible sites on the Casino Rewards network, so hopefully this can change at a later date. 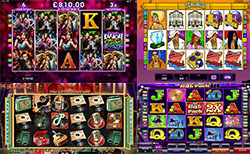 Aztec Riches uses software from Microgaming, which is one of the largest providers in the world today. That has been the case for a number of years now, but there have been positive developments in more recent times. Basically, Microgaming now has Rabcat and Just for the Win as internal software studios. Aztec Riches Casinos has an RTP of 96.26% measured over the course of last year. This is one of the highest industry percentage, which guarantees you a higher payout. In the games, there are plenty of options across the several available categories. Please be aware, however, that Aztec Riches does not have live dealer games. • Video slots: there are so many familiar slots, including Titans of the Sun, Hot as Hades, Goldwyn’s Fairies, Haungdi, Fortune Girl, Franken Cash, Tomb Raider, Bridesmaids, Game of Thrones, Terminator 2, and Tarzan. • Progressive jackpots: Aztec Riches has a number of jackpot games, including Caribbean Draw Poker, Major Millions, and Jackpot Deuces. • Video poker: poker players can get their fix on the likes of deuces wild, deuces & joker, 10s or better, jacks or better, and other variants. • Roulette wheels: the standard roulette games cover multi-wheel, multiplayer, French, Europe, and the US. • Blackjack tables: Aztec Riches can offer blackjack tables running rules from Spain, Europe, Atlantic City, Vegas Downtown, and Vegas Strip. These can also come in multi-hand, perfect pairs, and single-deck variants. Aztec Riches does not have its own dedicated VIP programme. Instead, Aztec Riches is a member of Casino Rewards, which is a network of sites connected to a single loyalty initiative. This is an approach that can really have its benefits. The large scale of the Casino Rewards programme means that Aztec Riches users can have the chance to benefit from side jackpots, sweepstakes, and various prizes. Of course, there is also a wagering system where comp points can be exchanged for cash at a later date. There is a handful of different telephone numbers available for international regions, but all players will have the ability to utilise email or live chat instead. Those can be used to bring up any queries or issues, if they should emerge. Aztec Riches users should be fully aware that they can only play in English if they access the instant-play casino. If users have windows, then they should install the Aztec Riches desktop client to have more than 20 languages at their disposal. By the way, it is also worth checking out the pages of resources made available. These include the highly in-depth terms and conditions and security page, but Aztec Riches also provides frequently asked questions and answer, which are more easily digestible. Staying secure is vitally important for online casinos, as players submit personal details and money to their accounts. Fortunately, Aztec Riches has installed secure sockets layer (SSL) encryption to shield that sensitive information from outsiders. Just make sure to be signed in before sharing any details whatsoever. Moving forward, it would be great if Aztec Riches could increase the bonus percentages, integrate mobile compatibility, add live dealers, and diversify the language support on instant-play. That is because Aztec Riches does an impressive job of providing fun games to play across video slots, progressive jackpots, and table games.